Vitality Dental Arts, a fast-growing Illinois-based dental lab, has announced a multi-year agreement with FactoryFour and LabStar Software to implement next-generation production workflow management alongside their lab management solution. By combining FactoryFour and LabStar, Vitality Dental Arts will achieve the “holy grail” of lab manufacturing, elusive until now: knowing the true production cost of every single restoration they create. Vitality relies on LabStar to manage its everyday operations including order entry, manufacturing, scheduling, logistics, client communication, and billing. As they’ve grown, Vitality realized they needed even more precise control over their production floor to truly understand their manufacturing costs and improve business decision-making. Specifically, this means using FactoryFour to build scalable, highly customized manufacturing workflows for different products. In addition to fine-grained control of the production process, it will also yield data analytics and custom reporting not seen before with standard dental lab management software. The breakthrough in finding this solution was the ability to integrate FactoryFour seamlessly with LabStar Software. FactoryFour provides manufacturers real-time insight into their work-in-process. The cloud-based application allows users to completely customize workflows to their unique requirements, as well as gather real-time manufacturing data. Manufacturers small and large use FactoryFour to gain visibility into production, minimize lead time, and make strong, data-driven decisions for their business. LabStar provides cloud-based dental lab management software. 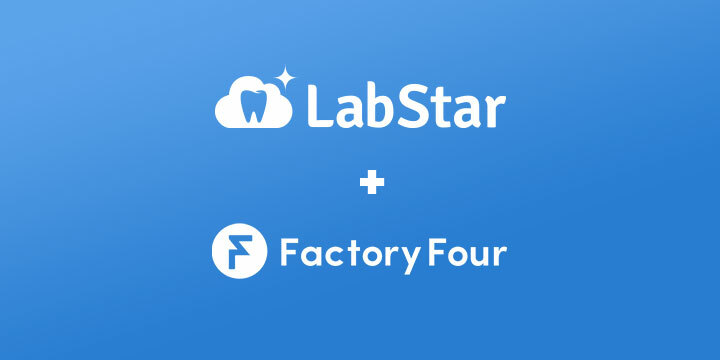 The integration with FactoryFour allows LabStar users to scale and improve production workflows while managing their overall business with LabStar. After entering cases into LabStar, labs can track production in real-time and receive work-in-process reporting while handling billing, logistics, communication, and customer support through LabStar. “We are excited to partner with FactoryFour. LabStar users can already create customized production lines by task, but with FactoryFour, our users will be able to build additional workflows within each task. The increased visibility into the production process will help our customers improve decision-making and tighten cost controls,” said Jeff Noles, CEO of LabStar Software. For labs interested in integrating LabStar Software with FactoryFour’s offerings, please contact us, or feel free to reach out to FactoryFour directly for a demo at https://factoryfour.com/ or email FactoryFour at demo@factoryfour.com. Vitality Dental Arts, headquartered in Chicago, is one of the nation’s leading dental laboratories. Combining the most advanced technology with high-touch customer support, the growing number of branch offices focus on providing the local support and personalized service dentists require. It provides the full range of restorative products, with a particular emphasis on CAD/CAM. Vitality Dental Arts was featured in the 2015 Inc5000 list of the fastest growing companies in the United States. FactoryFour is a next-generation manufacturing management system that focuses on customizability, ease of use, and speed to deployment. FactoryFour applications gather truthful, real-time data so manufacturers can minimize lead time and make strong, data-driven decisions for their business. With experience working in several manufacturing verticals from automotive to medical, FactoryFour has integrated with several ERP and MRP products to provide meaningful solutions to customers. See FactoryFour’s announcement for the integration here.